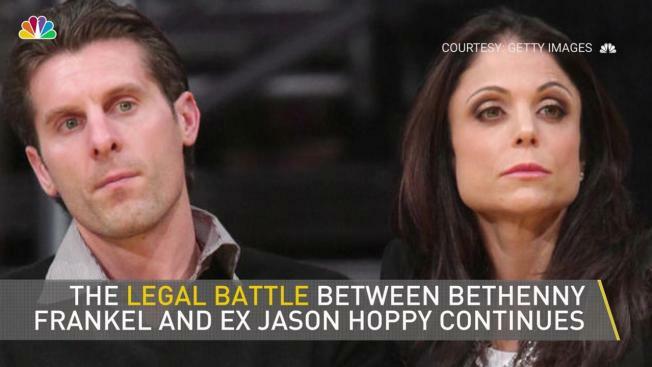 Despite having finalized their divorce nearly one year ago, the legal battle between Bethenny Frankel and her ex-husband Jason Hoppy continues. Hoppy was arrested in January after he allegedly sent the "Real Housewives of New York" star multiple emails and texts and showed up at their 6-year-old daughter Bryn's school to confront her. He was charged with one count of second-degree aggravated harassment, one count of fourth-degree stalking and one count of second-degree harassment. He appeared in court for the charges on Tuesday, and a spokesperson for the New York District Attorney's office confirmed to E! News that he was arraigned on additional charges, including one count of third-degree stalking and another count of fourth-degree stalking. E! News reached out to Hoppy's attorney for comment who said a motion was filed to dismiss the prior charges. As for the new charges, the attorney added, "We deny the allegations and will answer them in court [on August 8th]." Frankel's attorney has not returned E! News' request for comment. Frankel and Hoppy were married for two years before filing for divorce in 2012. Their divorce took nearly four years to finalize as they fought over alimony, child custody and Frankel's New York City condo. By July 2016, Hoppy had moved out of the Tribeca home and a few weeks later, their attorneys confirmed the divorce was finalized. However, the road remains rocky for the former couple. Frankel filed a complaint last year accusing Hoppy of sending her over 160 emails and several text messages between November and January. She also told police he contacted her via text message and email between August and November, including one message that allegedly read, "I will continue to communicate with you as often as I see fit in hopes that you will stop regardless of any attorney you retain." According to that complaint, her attorney sent Hoppy a cease and desist letter on Nov. 22, 2016. Hoppy was arrested earlier this year after sending more emails and texts and showing up at Bryn's school to confront Frankel. "The victim stated he made numerous emails and FaceTime calls, which placed her in fear for her safety," a court public information office told E! News at the time. "She said the communication was unwanted." According to Frankel's complaint, Hoppy approached her and her former boyfriend Dennis Shields at the school on Jan. 27 and repeatedly stated, "OK I see. This is how you want to do this. OK. You can play your game. It doesn't matter. You can get 10 lawyers. There's nothing you can do to stop me. You'll be sorry. You've been warned. I can't help it. She's pure evil. You've been warned. Don't say I didn't warn you." Hoppy denied the allegations as "false charges" and rejected a plea offer in court in March. People was the first to report the story.